4.92 out of 5 based on 32 reviews. Every Mum has dishes! Mountains of them … but getting them all clean, hygenic and with a sparkling finish can sometimes be tricky. 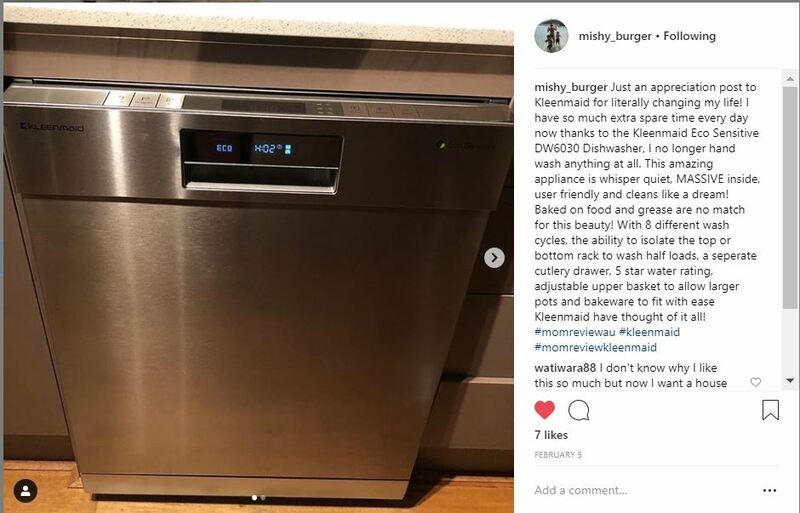 Which is why we are so excited to share that we have 4 brand new KLEENMAID DW6030 STAINLESS STEEL DISHWASHERS to send out to MoM Members to review!! 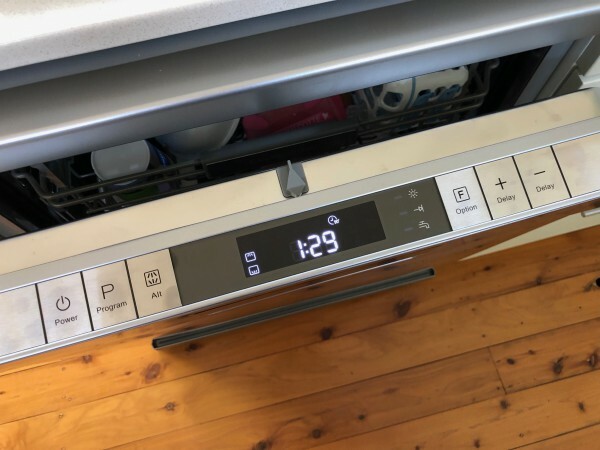 The exciting new DW6030 dishwasher comes with Information Transfer Technology which allows you to see the programme and special function selected, the temperature of the wash load and the time remaining on a front screen throughout the wash cycle. The superior Brushless DC motor is quieter, more reliable and more economical to run than all previous models. Whisper quiet 45dBa. The DW6030 can accommodate 15 place settings due to the new sliding detergent dispenser and has 8 pre-set wash programmes with 32 optional variations, including a 15 minute super rinse and 30 minute fast wash, so there is no shortage of wash choices. Multi Tilt and Split allows you to accommodate long stem glasses whilst still having a third row cutlery rack. Using only 11.8 litres of water per wash gives the DW6030 a highly coveted WELS five-star water rating. Energy Rating is 4 stars 238 kWh per year. To make your life easier the DW6030 comes with an impressive list of extra features and safeguards including anti overflow protection, up to 24 hour delayed start on hourly intervals, easy lift adjustable top basket, 70C hygienic sanitization option, self-cleaning filter system, LED interior lighting, and height adjustable cabinet. The Brushless DC motor has a 5 year warranty, and now there’s a 5 year full parts and labour warranty on the rest of the appliance. This is supported by Kleenmaid’s highly skilled national service network. If you are lucky enough to have a Kleenmaid DW6030 as well as the review team … why not share a VIDEO REVIEW with us?! We’d love to see what you think. A Special Offer for MoM Members worth $600! 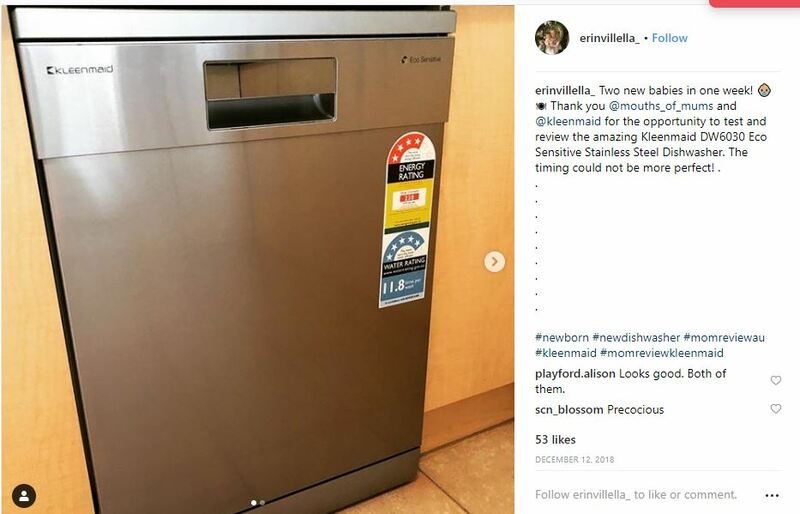 This review team was so impressed with the results that they wanted more people to experience this wonderful appliance. 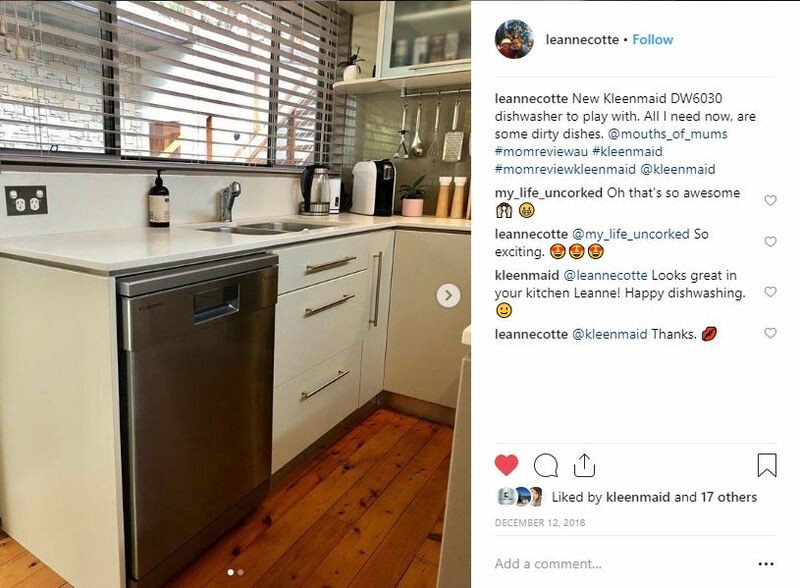 Whether you’d like the Kleenmaid Eco Sensitive Stainless Steel Freestanding Dishwasher, the Kleenmaid Eco Sensitive Fully Integrated Dishwasher with 8 programs and 15 place settings or the Kleenmaid Semi Integrated Dishwasher with 8 programs and 15 place settings … you can get each one for $1,099 (+ shipping) instead of $1699. And it gets even better, as you can pay a 25% deposit now to secure the special MoM discounted price and Kleenmaid will store the dishwasher for you for up to 6 months. If you’re interested in purchasing, jump over to the KLEENMAID PROMO PAGE RIGHT NOW! Once you have made your selection, you can purchase from the web page for immediate delivery. 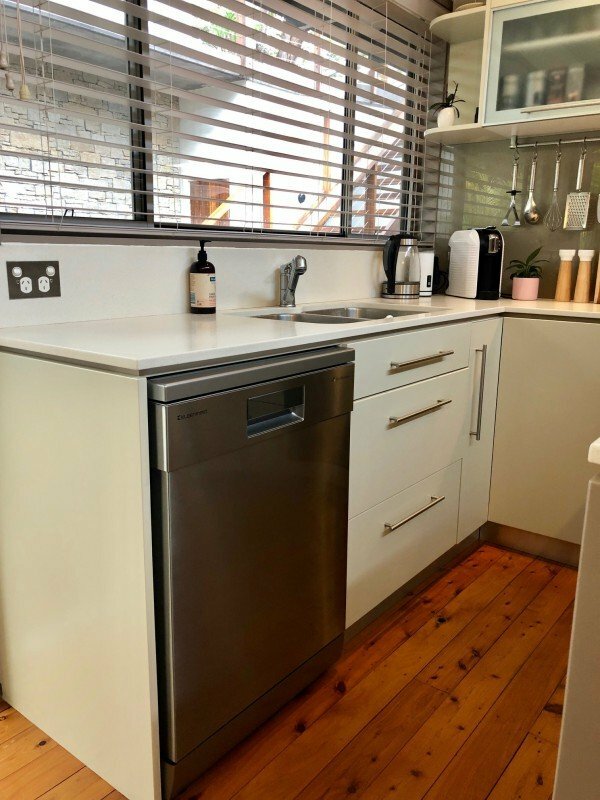 Alternatively, if you would like to pay a 25% deposit to secure the special price now and have Kleenmaid store the dishwasher for up to 6 months, please call Sue at the Kleenmaid head office on 02 9310 1207 to make arrangements. HURRY!!! This offer is only available until 28 February 2019. Since trialing the Kleenmaid Eco dishwasher I have started to put all my pots and pans through the cycle designed specifically for pots etc. With previous dishwashers I have had I wouldn’t have put pans / pots etc through the dishwasher as they wouldn’t come out very clean at all. However I have not hand washed a pot or pan in weeks as they come out sparkling clean every time. With the room in the dishwasher I’m able to get 5 pots and one fry pan tucked in nicely, another great feature to this outstanding product! Not only did I hope that the Kleenmaid Eco Sensitive DW6030 Dishwasher would lived up to expectations, but it blew them out of the water! I’m super impressed with its overall performance. So many amazing features that I’ve actually enjoyed learning about. You can also rest assure as it comes with a 3 year warranty, plus 5 year warranty on the motor. 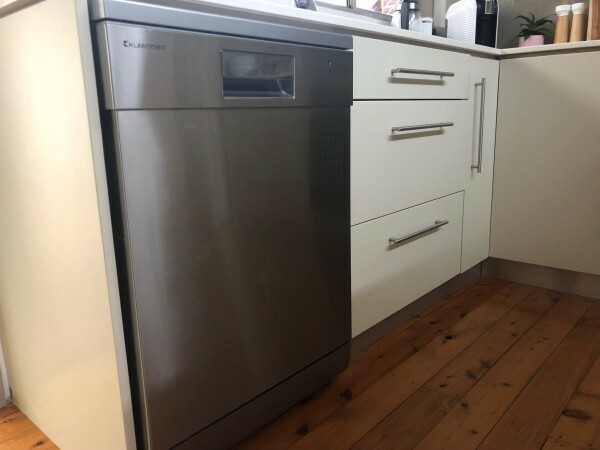 The dishwasher also uses only 11.8 litres of water per wash, which gives the Kleenmaid DW6030 Dishwasher 5 star water rating, which is fantastic. 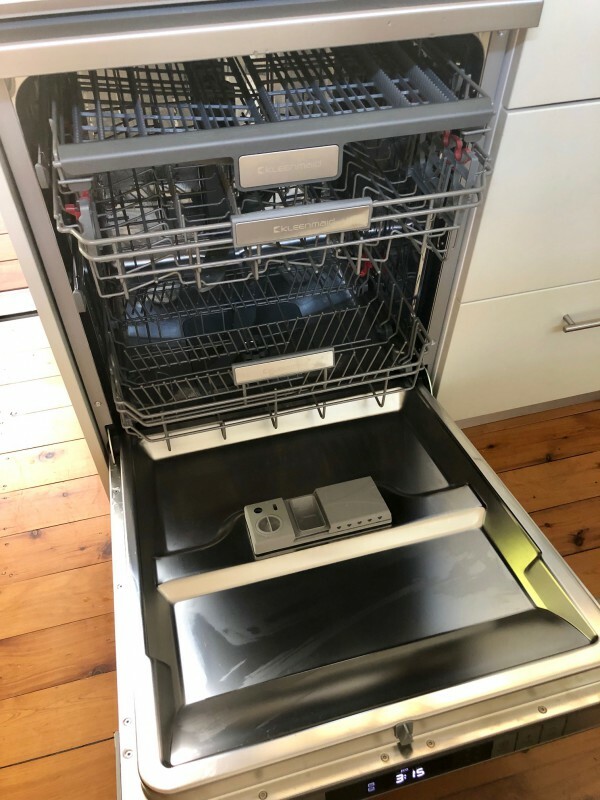 The Kleenmaid DW6030 Dishwasher has so many features my old dishwasher didn’t have, my favourite being how quiet is it when is running due to the brushless DC motor. Oh and did I mention it cleans amazingly. And thats the most important thing right! Overall I’m extremely happy with my Kleenmaid Dishwasher and would recommend to anyone looking at purchasing a new dishwasher. Whoever said baking with an over enthusiastic toddler is fun and easy has never done it in real life! Don’t get me wrong, I absolutely love baking with my 2 year old daughter Siena, and we do it often! Siena loves putting on our matching aprons and pouring, mixing, rolling and tasting our recipes. That being said, the entire process is always very stressful and very messy! 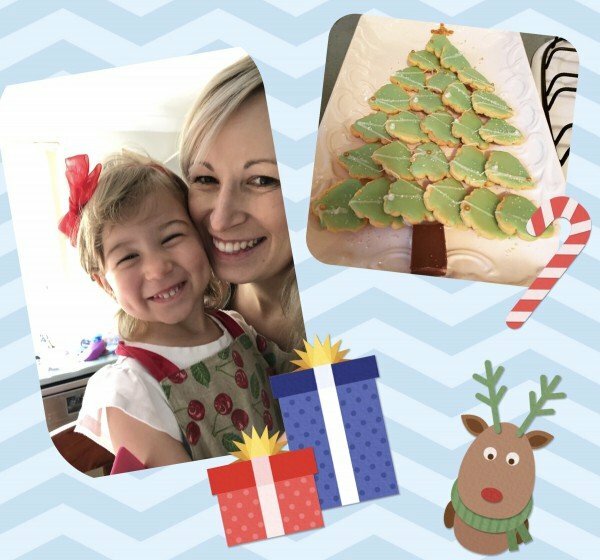 Siena and I made two types of cookies for Christmas 2018 which resulted in an overwhelmingly messy kitchen. You can imagine my husbands surprise (after telling him we were spending the afternoon baking) when he came home to a spotless kitchen. My final batch of cookies took 15 minutes to bake, and I managed to clean up the entire kitchen in that time with Siena dancing around my feet. 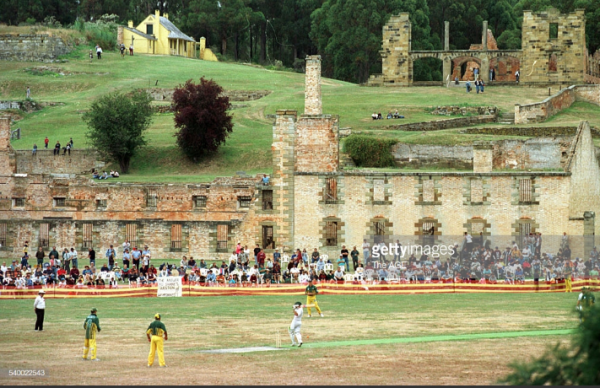 This is where the magic of the Kleenmaid DW6030 came into play. I was able to fit all the baking implements (measuring cups, jugs, spoons, and small bowls) into the upper basket. The lower basket allowed me to fit 2 large Kitchenaid bowls, as well as large mixing bowls and our lunch dishes by folding down the dish racks with the easily adjustable features. Using the heavy cycle (Pre-wash at 45 degrees, wash at 55 degrees, rinse, second rinse at 65 degrees, drying) ensured that all the butter, cookie dough and icing residue was cleaned off dishes completely, before they were thoroughly dried. The heavy cycle runs for 185 minutes, using 1.1 KWh of energy and 15 Litres of water. Usually I would take at least an hour to clean the kitchen, hand washing and drying all the dishes. So I’m more than happy to let the Kleenmaid DW6030 take the stress out of Christmas preparations! Friends who have come over have commented, on my new amazing toy in my kitchen. I love showing them some of the cool features. We had friends over for dinner, so after the table was cleared I proceeded to fill the dishwasher with my girlfriends eyes directly on me. She had never seen a buttonless dishwasher and couldn’t believe when I opened and showed her the control panel within the door. 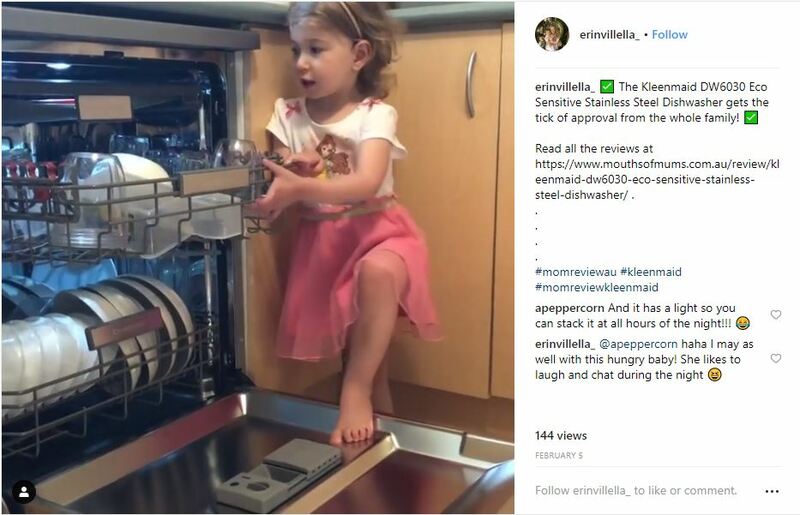 My kids have also taken a liking to the Kleenmaid DW6030 Eco Sensitive Dishwasher. They are willing to help with stacking the dishwasher without too much complaints. My 8 year old daughter loves using the cutlery draw and placing our cutlery neatly side by side. She finds it very easy to use, which is great for a mum who is looking for chores the kids can do. Would recommend this dishwasher to all my friends and family. While using some of these washing options I’m amazed at how whisper quiet it is. This is due to the Kleenmaid’s DW6030 Brushless DC Motor. Our lounge room is located directly next to our kitchen, so quiet is important! It’s great that we can watch a movie while having our dishwasher on, without being disturbed by loud noises. If it wasn’t because of the outside display screen, you would think the dishwasher is not even on. I’m simply amazed at how much this dishwasher can fit..with ease! am absolutely thrilled with the large volume of dishes I can easily fit into this amazing dishwasher. A simple push handle release adjusts the upper basket making it a breeze to fit large pots, pans and baking trays etc. The upper basket provides fold back racks to secure glassware or easily fold down to accomodate larger items such as protein cups, tupperware, lids and saucers. The seperate cutlery drawer holds 74 pieces of cutlery without impending on the upper and lower baskets. The design and functionality of the Kleenmaid Eco Sensitive DW6030 dishwasher is incredibly user friendly and simply genius in my opinion. The Kleenmaid DW6030 Dishwasher has heaps of room inside. It is big enough to accommodate a, 15 place setting. That’s roomy right! You can fit more in, due to the sliding detergent dispenser. This is a great future. You have an upper basket which you use for placing cups, saucers and small bowls. I also pop my sons baby bottles in here. The lower basket is for plates and larger objects like pots and pans. This is where the real dirty items should go. And the cutlery basket. Still getting use to the cutlery drawer as my last dishwasher had removable standing cutlery basket. You just lay cutlery in the draw, so they are not touching. With the upper basket, you can adjust the height level easily. I’ve used both heights in different loads I’ve put on. The cutlery draw can also be adjusted into 5 different positions. There is a diagram on the front of the tray to show you all the different positions you can use. One of the positions allows you to slide one half of the try on top of the other. This allowed me to place our tall protein shaker cups in the basket below. So far, we have found all our dirty items can easily fit in the Kleenmaid DW6030 Dishwasher, without any fuss. This means I don’t have items needing to be hand washed, because they don’t fit into the dishwasher. This makes me extremely happy. I really love the external look of the Kleenmaid DW6030 Dishwasher. It makes my kitchen look so pretty. You will see no buttons present on the front door but on opening, you will see the control panel nicely hidden away. Great for little fingers, who love to push buttons mid wash. There are 8 pre-set wash programmes with 32 optional variations. So, I’m sure there will always be option for whatever wash type I need. I found using the settings quite simple to use. A feature that I haven’t seen before is dual zone wash, which means you can select that only the upper or lower water nozzle is activated during the wash cycle. Great for when you only have half a load needing washing. You also have a delay start feature which allows you to determine when you want the next wash to start. When you shut the door, you will see the temp, wash load selected and the time remaining on the front screen during the wash cycle. You will always know when its going to be time, to start unpacking. If Looks Could Kill..... Kleenmaid DW6030 Dishwasher Looks SPECTACULAR! 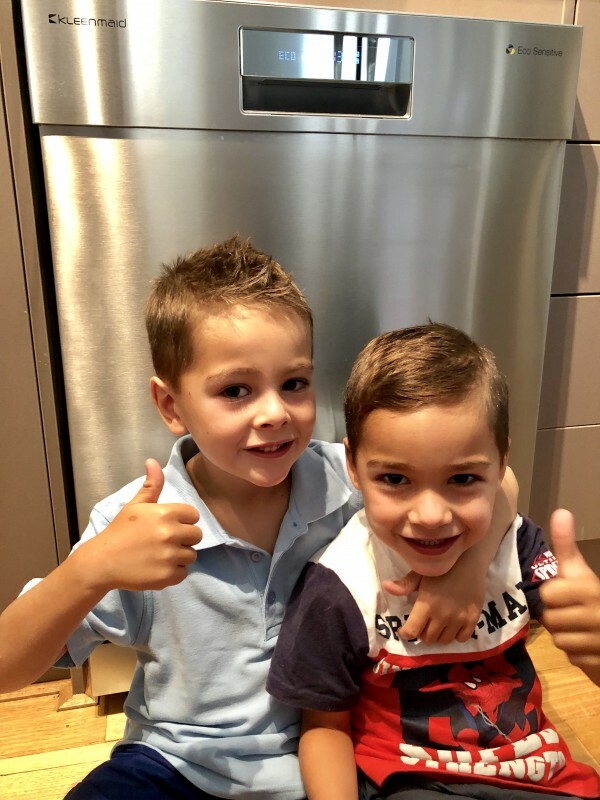 My kids are so happy to have more time with Mum! 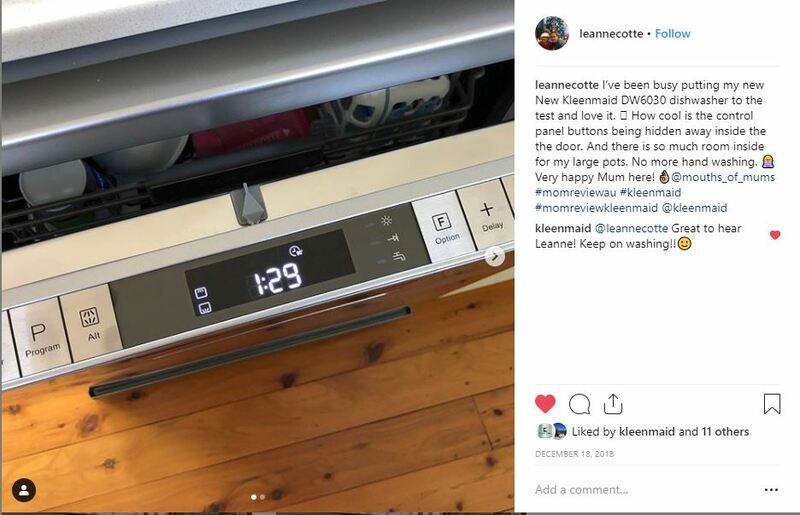 I love how much spare time I have every day now that I no longer have to hand wash anything at all thanks to the amazing Kleenmaid DW6030 Eco Sensitive dishwasher. I use my dishwasher twice a day. 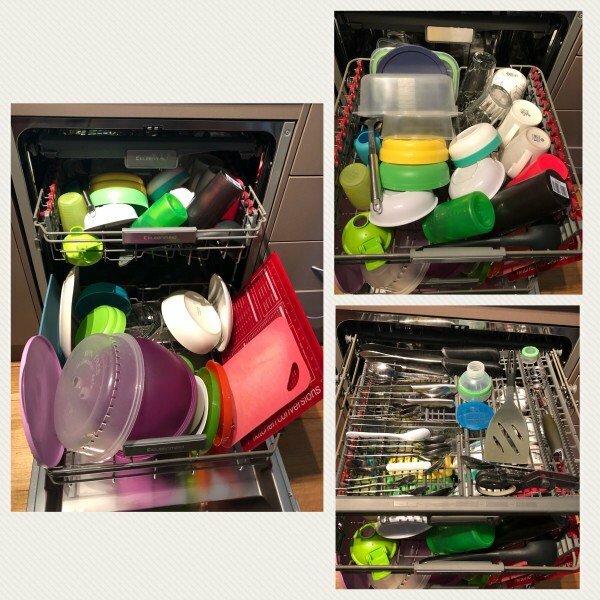 One quick 90 minute express wash for the mountains of cups, plates, bowls, glasses, lunchboxes and cutlery my kids use daily. In the evening I use the Eco sensitive wash for dinner plates, pots, pans, baking trays, cooking utensils and heavily soiled items. I’m yet to find anything this amazing appliance can’t wash off perfectly! Grease, baked on foods and dishes I would normally have to scrub and scrub are washed off with ease, I am extremely impressed! The Kleenmaid DW6030 is amazing! Firstly, it’s not just a dishwasher but a statement for your kitchen…it’s stunning! 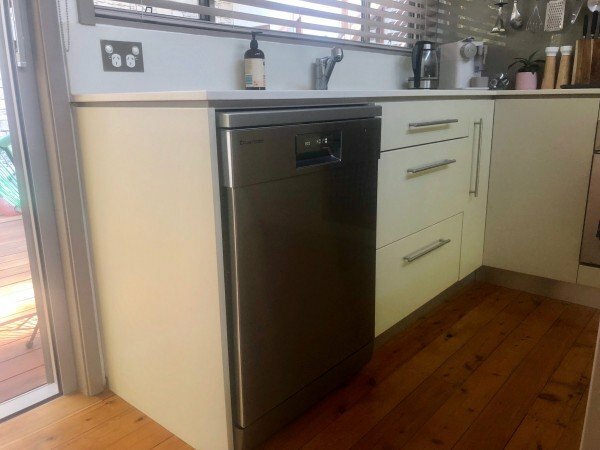 I love the look of this dishwasher as it’s stylish, modern and sleek, so not only does it work really well, it looks gorgeous doing it! I like everything about this machine, but I’ll go through a few of my favorites. Firstly, it’s super quiet. I have a young son and a small house, so any noise that gets made it easily heard anywhere in the home. My son is a light sleeper too, so I was a bit worried about how noisy it was going to be, but it’s so quiet! I even forget its on until it beeps to me to tell me it’s finished! I also love that the buttons are all hidden on the top of the door and not visible at the front. This was a huge tick in my books as inquisitive little hands like to press buttons, but without them on show, he has no interest in it at all. I think it looks very sleek too with just the control panel on the front. The cutlery draw is great as you can configure it into 5 different settings so you can always fit what you need to in and can even condense it so you can fit taller things in on the second shelf like glasses etc. It has so many variations on settings from glasses, to intensive…even an auto setting so it works out for you what setting it needs to go on! There really is a setting for whatever you need to wash. And don’t worry, all the settings are easy to figure out and program – you don’t need a degree! The top shelf can be lowered or placed up high to allow for more flexibility and ease of things fitting in the lower shelf which I think is a brilliant feature. It has a light too which, while isn’t necessary in a dishwasher, is a great feature allowing you to see right into the back while loading and unloading. Finally it has a 5 star water rating which is absolutely brilliant in keeping your water bill down and also reducing the amount of water being wasted. In all, I am 100% happy with this Kleenmaid dishwasher. Easy to use and understand, It really is a beautiful dishwasher with so many features to suit any family dynamic. I would definitely recommend this and tell anyone who is in the market for a new dishwasher to go and look at one because I would find it hard to fault. What food residue? A thing of the past! My new Kleenmaid DW6030 does such a thorough job – even with pans covered in food residue. I can fit 4 or 5 pots and pans in one load so I often use the “Intensive” programme which is designed specifically for the job. In the past (particularly if I’ve left pots overnight), I’ve had to wash them again once the cycle was finished. Now though, there’s no need, because they come out squeaky clean! The Intensive Cycle takes 175 minutes (and remember the time is displayed on the front so you can always see how long is left), and it’s the hottest cycle available. It washes at 60 degrees and rinses at 70 degrees and then it dries (most of the cycles dry – and I do like that feature). I’m thrilled with it – it’s so efficient and has definitely made life easier! Cleaner Dishes In An Instant! Recently I have used the glasses only wash to rinse through all my glasses in the cupboards, what I have found in the past with previous dishwashers is that I would end up with broken glasses, wine glasses filled with water and streaky lines through the wine glasses. So I went through the cupboard and pulled out all my glasses ( wine, champagne, tumblers) and put them through the glass cycle and I was so amazed and happy with the results. Not one streak not one breakage and not One wine glasses was full of water!! 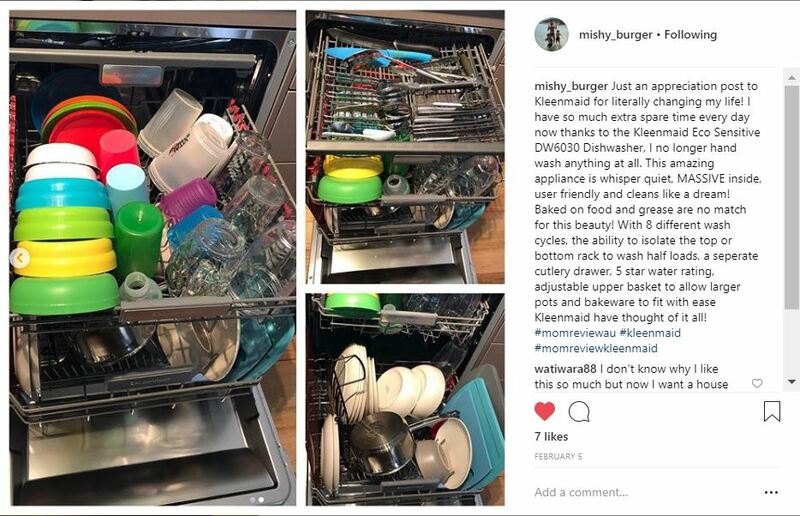 Just another fabulous feature that this amazing dishwasher has! 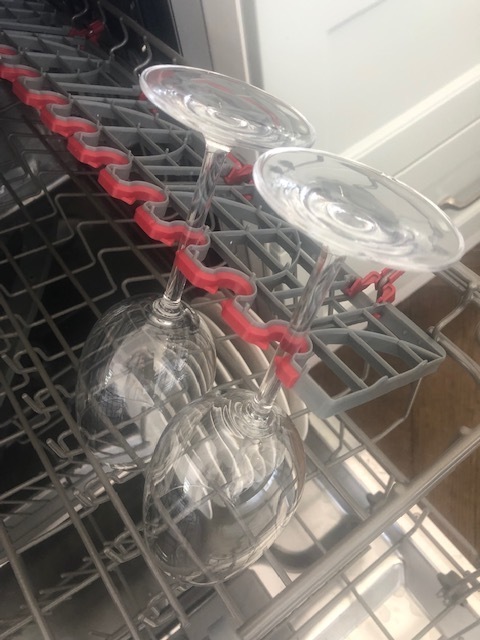 There are so many things I love about my new Kleenmaid DW6030 dishwasher, but one feature that stands out for me is the multi tilt rack that is designed to accomodate long stemmed glasses. You push the stems in firmly and they are gripped so securely that they don’t budge an inch during the cycle. My old dishwasher didn’t hold the glasses in the same way so you’d often find them on their side full of water or worse still, broken. It’s a small thing, but whilst entertaining over Christmas it’s been a life saver. Before, I’d have hand washed the glasses in case of breakage, so the Kleenmaid has been brilliant and saved me time and effort! Five stars! After using this dishwasher for two weeks now I have really got to know her! One of if not my favourite features is being able to change the middle shelves setting to fit bigger plates in! We have all different size plates and with previous dishwashers that I have owned the wash spinner has always bumped against the plates! With the Kleenmaid it really has thought of it all! This feature has made this maid ???? very happy! And once again the space is just amazing! The amount I can fit in there everyday still blows my mind. Exceptional clean, streak free results EVERY TIME! Three weeks of daily use and I am completely blown away with how well the Kleenmaid Eco Sensitive dishwasher cleans and dries all dishes plastic, glass, silicone, china, ceramic, stainless steel no matter how greasy and heavily soiled. 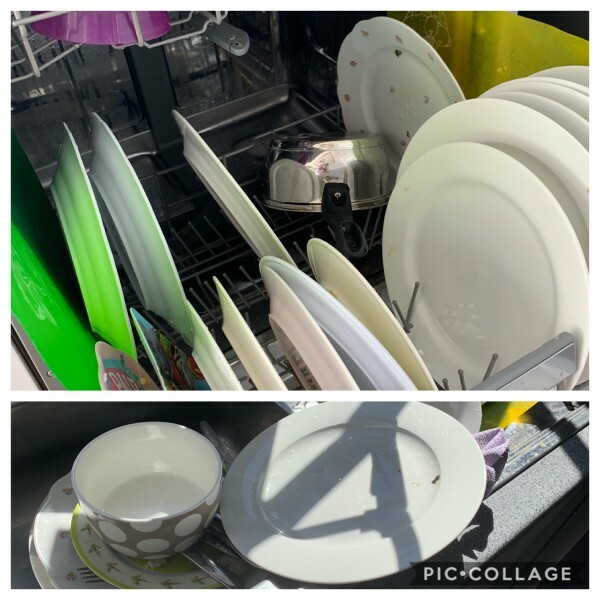 I’ve left dirty dishes sitting in the dishwasher for over 24 hours (waiting for a full load) before washing and the results are perfect every time! When hand washing I found I could never fully remove the greasy/oily film on my roasting racks and casserole dishes..One wash on Eco cycle in the dishwasher and those pesky dishes are now squeaky clean and look brand new, I am absolutely amazed! Please ensure you have first-hand experience of this product before you post a review - it's important all reviews are genuine & honest. What would you say about this product? Please note your review must be at least 50 words to earn MoM rewards points. Would you like to add a Video Review? Include a short Video Review sharing your experience and opinions about this product and EARN AN ADDITIONAL 150 MoM REWARD POINTS! Simply upload your Video Review to your own YouTube channel and then include the link to that video in the box below. If you need a little more information on how to do this, have a look at our "How to Add a Video" page. Thanks for taking the time to post your review. Your commitment to helping us make Mouths of Mums the best product review site for mums makes all the difference. By taking the time to post your review, you are now on the list for future reviews.